It’s been awhile since our last product review of Vitalsox back in June. A new manufacturer of running socks. I first came across Mantra Tees two weekends ago at the Cougar Country Classic 5K where I had the opportunity to stop by their booth at the race. Mantra Tees is an Austin based company and in keeping with our “Keep Austin Weird” reputation – I think it is safe to say I can’t imagine them being located any place else. 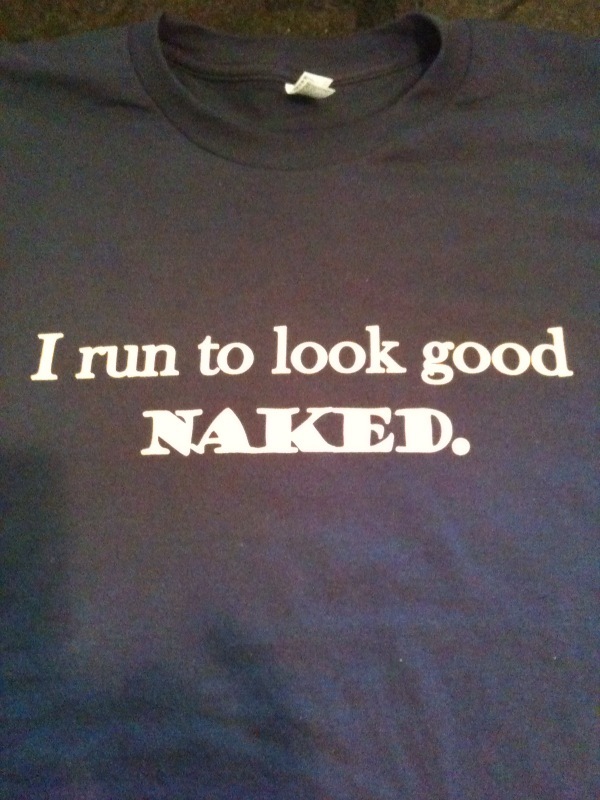 By visiting their website at: http://matratees.com/aboutus.sc you will learn that the company was started because they love running and love inspiration through humor. When the owners started racing they designed fun, custom shirts that would provide inspiration not only to themselves but to fellow runners. They were pleasantly surprised by all the positive feedback, and after being asked at every race where they got their shirts, they decided to share their designs with others. Most of their designs are inspired by what they have seen and heard during races and training runs. They claim to not be elite athletes, which as they put it, “affords them a bit of time to check out fellow runners’ gear“. They claim that their favorite shirts and spectator signs have always been the ones that made them laugh and were just a bit – inappropriate. Now, if you are like me there is a whole lot about our sport that will make you laugh – because if you didn’t – you would feel like crying. The other certainty is the fact that runners love their gear. I could not even venture to guess the number or running T’s and race shirts I have accumulated just in the last year. Point being if not for being out of town I would have raced last Thursday night at the Maudie’s Tex Mex Moonlight Margarita Run primarily for the cool T-Shirt. “Running …. The second best way to cause chafing”. As part of my hard-earned age group victory (had to work that into the post for good measure) at the Cougar Country Classic – I was awarded a free shirt of my choosing from the folks at Mantra Tees. I wore the shirt proudly to my birthday dinner as well as a few laps around Home Depot over the weekend. It drew a few snickers and a “where did you get that?” or two which is always a sign that you are on to something. I realized just how great an impact my Mantra Tee was having when the TSA Agent checking my ID flying to Charleston last week remarked that she liked my shirt. Pretty tough to get those guys to crack a smile. Later on when I was spending time with my good friend Keith and his boys in Charleston one of the women at the house – after one or two adult beverages – walked up to me, read the shirt, looked me in the eye and said, “Prove it”. With my wife more than 1,300 miles away and unable to protect me, I just smiled and told her it wasn’t false advertising. She looked over at my friends and said, “He’s scared”. I have to admit, I kind of was …. As for the product itself, I opted for the standard Cotton T-Shirt instead of the Technical Shirt, mostly due to the fact that it has been so hot this summer I have not run in a shirt in close to two months. The Tee is made of 100% cotton from American Apparel and is one of the softest Tees in my drawer. It made it through its first few runs through the washer and dryer and has kept its original shape and size. I would say that the men’s shirt runs just a little on the larger size. According to the sizing information on the web-site – Mantra Tees states that the Women’s shirts tend to run just a bit small. So if you are in the market for an inspirational T-Shirt or Technical Shirt before your next group run or race, stop by and visit the folks at Mantra Tees. If you are creative and have a great idea for a shirt – you can actually e-mail the group at admin@mantratees.com with your concept. If they use your design you could earn $500 and a whole lot of bragging rights! As is the case with all product reviews at Run for Dom – these are simply my honest opinions on a product after I have had time to try it myself and see how it holds up. I am in no way compensated for my time or my opinion – although if the folks at Mantra Tees were in a giving mood – I really would like to try out one of their technical shirts – you know – for scientific research purposes. I love it, I’m always a little inappropriate so these shirts are perfect for me. Thanks for the review. Oh my gosh I love it! 😀 So fun and I adore when people can take a joke. Totally going to check them out.